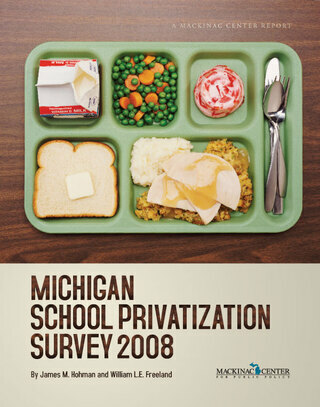 For the fifth consecutive survey, privatization of school support services increased. The 2008 survey shows that 42.2 percent of Michigan school districts contracted for at least one of the three major noninstructional services: food, custodial or transportation. 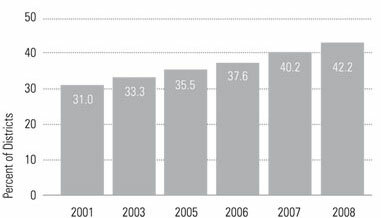 This is an increase of 4.9 percent from last year and an increase of 36.1 percent since the survey's inception in 2001. This year's survey includes only 550 districts. White Pine in the Upper Peninsula was not included this year as there are no students in the district. Detroit Public Schools did not respond to repeated requests for information this year. This is not the first year the Mackinac Center was unable to receive responses from all districts. In 2001, the initial survey year, only 228 districts responded. The survey received 517 responses in 2003. Surveys in 2005 and 2007 received responses from every district. The 2006 survey eventually reflected all districts after Detroit responded following the deadline of that year's survey. There were also 42 districts that reported discussing contracting out food, custodial, or transportation services within the fiscal year. [*] This is not the net total for the increase in privatization statewide because eight districts brought services back in-house from 2007 to 2008. A total of 11 districts brought services back in-house, but three of these ultimately contracted for a different function which kept them in the privatization category for the overall tally.